Given that not many local stores carry Ponaris in stock, we are now selling this product for $15 in our office for patient convenience. Ponaris is a wonderful product to alleviate the dry, irritated, and sometimes burning sensation in the nose, especially during the winter when the air is much drier than normal. It is also a great product to treat nosebleeds and nasal crusting. I like to think of Ponaris as chapstick, but made for the nose. To apply, it already comes with an eye-dropper. Just place 1-2 drops for each side of the nose and let it ooze down and coat the entire nasal cavity. Just like chapstick, one can feel the protective barrier for several hours after application. This can be applied up to 4 times a day as needed (just like chapstick). 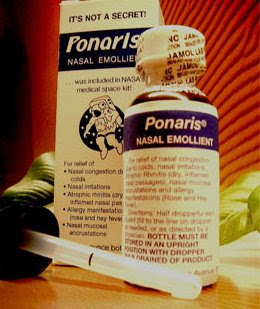 Alternatively, one can convert Ponaris into a nasal spray form instead of using the eye-dropper. Just purchase a saltwater nasal spray bottle over the counter (ie, Ocean Nasal Spray, Ayr Nasal Spray, etc). Empty the saltwater and clean out the nasal spray bottle thoroughly. Than pour the Ponaris bottle into the nasal spray bottle. That's it! Call our front desk to purchase it. NOTE: This product does contain iodine and should not be used by patients with iodine allergy. In those patients, CME Nasal Spray is recommended. CME Nasal Spray is available only as a prescription. How can you put a few drops in your nose and let it "ooze down" - if you are standing up, how do you get it in there? Do you have to lie upside down? Just tilt your head back (look up at ceiling) while placing drops into nose (same position as when you gargle something in your mouth).